Kverneland 4332 CT - 4332 CR – 4236 CT - 4336 CR - 4340 CT, Trailed mower conditioners with centre pivot drawbar, steel tine or roller conditioning. Working widths of 3.16, 3.57 and 3.94m. 3.16, 3.57 or 3.92m working width. Available with BX Swath belt or FlipOver widespreading kit. The Kverneland 4332 CT, 4336 CT, 4336 CR and 4340 CT are equipped with a centre pivot drawbar, allowing you to mow the field from one side to the other, and thus save time, as well as avoiding odd-shaped plots and tight corners. The hydraulic drawbar allows the turning circle to be significantly reduced. 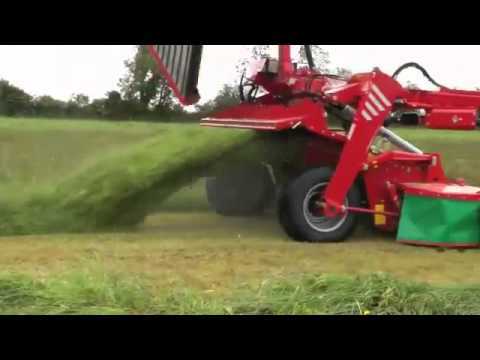 The potential for saving time and enhancing the efficiency of mowing and subsequent harvesting operations is substantial. The spreading vanes of C-models are moved hydraulically together with the drawbar. The Kverneland 4300 series benefits from the patented Kverneland ‘SuperFloat’ flotation suspension system. The Kverneland 4300 series can be fitted with the versatile Kverneland BX Auto-Swather belt to place two swaths into one. In this way the large swaths for large foragers or balers can be prepared, to speed up the collection of the crop. The swath belt can be raised and lowered from the tractor seat during operation. This allows you to adapt to each individual situation and requirement, without wasting valuable time.